Our friends Deepak and Aparna came to visit us this weekend, so of course Shankar and I had to have some sort of feast to honor them. 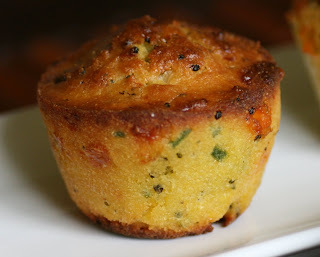 I had asked Shankar if he would make jalapeno corn bread, this way he could make it a day earlier and it would be perfect to heat up in the oven for the brunch we were planning. So off to the grocery store we went to pick up creamed style corn, jalapenos, and sharp cheddar cheese. The other day while we were browsing around Trader Joe's and purchasing several vintages for our cellar, we were offered some lovely samples of broccoli and cheddar corn bread. I asked Shankar to add in some broccoli (since I am on my new health kick and all) to the recipe. He was a bit skeptical wondering if it would alter the batter too much and if the ratio of flour blah blah blah ..... "Just throw it in already", I said. So he decided to make one batch of muffins with broccoli, and another loaf without, in case the broccoli massively screwed up the recipe. Well the corn bread was extremely good, but my dear darling husband in all his anxiousness over the addition of broccoli totally forgot to add in the creamed corn. So he is not a perfect cook after all. Close but not quite. This is another recipe from my brother-in-law Gopi's website. Verdict: I didn't even notice the creamed corn was missing. Too focused on how good the chunks of cheese were, and of course all that butter I slathered on it. Did I just say that? I meant how good the broccoli tasted. hey Kanchana, they look so cute and hot!! very pretty and lovely creation. sound like a spicy bread great to go with tea. Hey I have to munch on them...they look so pretty and hot of course! thanks for that lovely post & pics! whatever's inside or not inside them, they look awesome. you take lovely pics. your BIL is one heckuva foodie too. Now you're making me feel hungry! Lovely pix! they look awesome, i just love that tinge of green here and there!!! im literally drooling!!! 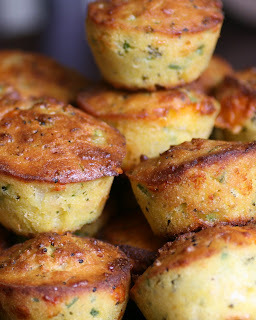 I love jalapeno, broccoli, cheese and corn bread so this recipe is just too perfect and my oh my... don't they look cute? 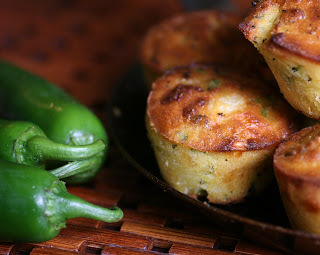 Cornbread with jalapeno and cheddar cheese...hmm..I can almost smell the aroma !! broccoli in corn bread! sounds innovative and they look delicious! Dont be too hard on S :-) it beats having a hubby that does not cook. How pretty!! I thnk I saw something similar recently on one of the Food Network shows.. did not pay much attention to it then. Aaah!! !what do I see up there!!!Fllllaaaat!!,,Kanchana!!! Looks irrestible... Would love to come over to ur place for a treat!! Seriously, it feels really nice to get this one. I might send you some of those puri's or come by and exchange a few for those delicious corn bread muffins. The photographs look super professional. Absolutely love them ! Did you move to a new cam ?? How I wish I could just have you all over for tea one day! Would that not be amazing? Lets have a convention!! Those buns look so yummy! I must try this recipe. Saw your comment in my blog. We too don't have the pooja as we are Iyengars. But I do it in a simple way. All the pooja method was given by my neighbour. I have mentioned in my earliar post. May be you too can offer prayers just like any other friday. So what if some ingredients are forgotten? They look great and tempting! The muffins look lovely. You can awesome way to capture the dishes on photo. Wonderful corn bread with healthy broccoli....ilike this sort of idea...Thanks for your visit,.hope everything going good. that looks DELICIOUS....and hey too bad you did not give Savithri the credit for the silicone muffin tray, the muffins look absolutely clean cut - want some too....pat on the back to Shankar! i would love to have this spicy bread! your whole family seems to be good cooks... lucky you! Bharathy of spicy chillly has noticed some common factors in us .....and asked whether we have met through the blogging circle. 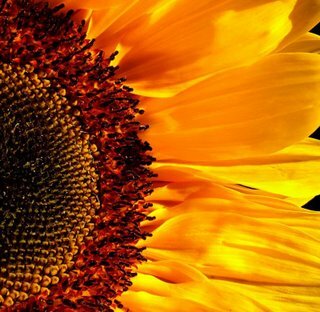 though i had taken quick glances of your blog this is the first time i am spending time here. 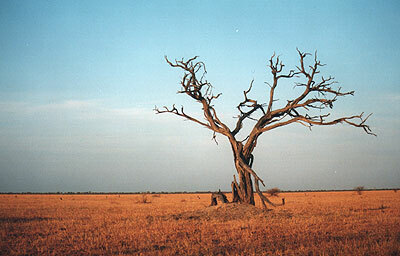 your blog is very appealing! you are in Michigan too? 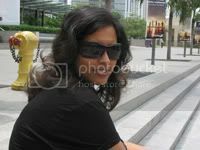 hi Kanchana, this is my first time to your blog. And i loved it :-) Will keep dropping by. The pics and the recipe looks yummy. I look forward to try iy out as snacks sometimes. i ve one more award waiting to Adorn married to a desi. Simply delicious! I can't wait to try this one...yummmmmmmy! Kanchana the bread look gorgeous. I always thought baking bread was a uphill task, but I get a lot of inspiration from blogger friends, who make it seem like a simple thing to do. These look and sound amazing, but I have one quick question...in the recipe, there is no mention of the broccoli; how much to use and whether you use fresh, steamed, chopped frozen or what...could you please let me know because I really want to try this recipe with the broccoli! Thanks so much for sharing!! These look scrumptious...going to have to make some...thanks for sharing!! Love your site and just happened to find it thru pinterest :) I will be trying this recipe tonight, Thanks!